ANNAPOLIS, Md. (AP) — When Navy coach Ken Niumatalolo watched tape of Tulsa’s football team, the footage was all too familiar. There were numerous narrow defeats, mistakes that made the difference between winning and losing, and a whole lot of simple bad luck. And that is why the Midshipmen (2-8, 1-5 American Athletic Conference) and Golden Hurricane (2-8, 1-5) find themselves tied for last in the West Division of AAC heading into Saturday’s game at the Naval Academy. Tulsa has lost four games by nine points or less and narrowly missed upsetting then-No. 23 South Florida, then-No. 23 in the Associated Press poll, falling 25-24 on Oct. 12. Navy’s list of frustrating defeats includes 31-30 in overtime lat SMU and 24-17 at home against Temple. Tulsa head coach Phil Montgomery believes both schools are better than the combined four wins would suggest. Niumatalolo is the longest-tenured head coach in the AAC, with 11 seasons at the helm. Montgomery is the only other head coach who has been in the AAC since Navy joined in 2015. Here are some other things to look for during Saturday’s matchup at Navy-Marine Corps Memorial Stadium. Navy and Tulsa are also similar in that both schools have run the ball effectively but have struggled in the passing game. The Midshipmen lead the AAC and rank third nationally in rushing offense with 295.6 yards per game. The Golden Hurricane are No. 33 in the Football Bowl Subdivision for rushing offense and feature two tailbacks with almost identical statistics in Shamari Brooks (797 yards, six touchdowns) and Corey Taylor II (748, seven). Navy has displayed very little in terms of passing this season, ranking last in the FBS with just 64.7 yards per game. The Midshipmen have completed four passes or less in seven of 10 games. 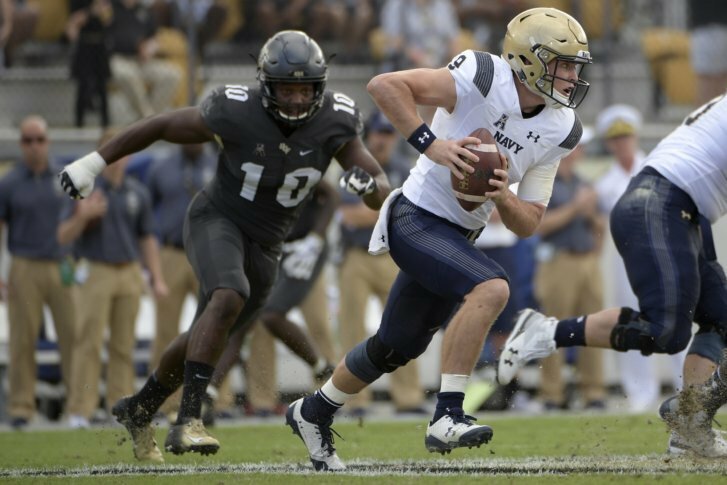 Navy’s offense took a step in the right direction during last Saturday’s loss at Central Florida . Zach Abey made his second straight start at quarterback and directed three touchdown drives during the second half as the Midshipmen finished with 374 rushing yards, their second-highest total of the season. It will be Senior Day for Navy, with the 34 varsity football players that are part of the Class of 2019 being honored during a pre-game ceremony. This senior class has not been quite as successful as its most recent predecessors, compiling a 27-21 career record and winning just three of seven games against service academy rivals Air Force and Army. Niumatalolo is hopeful Navy can snap its current seven-game losing streak on Saturday so the seniors can come away as winners in their last home game. Tulsa and the Naval Academy are among the smallest schools competing in the FBS. Tulsa, a private institution, has the smallest FBS enrollment with 3,343 students. There are 4,495 midshipmen at the Naval Academy. Navy just completed a four-game stretch against teams with a combined record of 35-4: Houston, Notre Dame, Cincinnati and Central Florida. The Midshipmen have played just two opponents with losing records (Lehigh and Air Force). Tulsa is playing eight teams this season that went to bowl games in 2017.